Sharon is shown above reading her "911" poem at the dedication for the SPIRIT OF OKLAHOMA, the picture was taken at the FF's Union Hall in Oklahoma City on April 19, 2002. The second picture is Sharon Frye with Dorothy Lake - widow of William Lake, who lost his life on 9-11 and also aided OKC after the Murrah Bldg. Bombing, her son Kyler, Kevin Hannafin, FDNY, who dug his own little brother out of the rubble at ground zero, also a FF who perished on 9-11, and Mike Hanson, NYPD, who aided OKC after bombing in 1995. The third picture is The SPIRIT OF OKLAHOMA, Sharon's poem "911" is on a plaque that was mounted in the front window of the fire truck. The final picture is The SPIRIT OF OKLAHOMA slogan. Served straight up with firehouse candor. And test all the gear from bumper to bumper. Came the call, then fast-paced strides. Not knowing, but trusting, what fate they'd meet. Soon to grasp horror that would change all time. They'll die with all honor of giving their all. Lord take them to heaven, they've given enough! 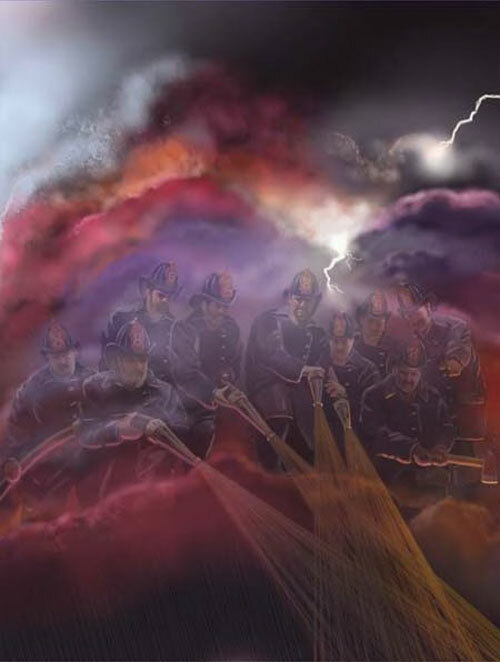 A tribute to those firefighters who lost their lives on September 11, 2001 and those left behind, that continue to sacrifice and dedicate themselves daily for our safety.